Whether you love to cook or not, there are many different and easy ways to cook that you can use. Once you master these, working in the kitchen will become easier and more enjoyable. Learning different methods allows you to be more knowledgeable and creative with food. We included 10 methods of cooking and recipes to try in this lesson. One of the most popular methods of cooking is baking this is probably one of the easiest to master; you will simply need to heat the oven to a temperature and then place your food in. You will need to keep an eye on the food and often it will need to be covered to maintain the moisture. After a selected time the food can be removed and served, baking is ideal for breads, casseroles and pieces of meat. This is a great method to get kids started in the kitchen with you. Boiling is very popular for vegetables and can be done on the top of the stove. You will need to place a saucepan of water on the stove to boil and once it is boiling then place your food into the water. You must ensure that you keep the pan covered to capture the nutrients. Pasta, boiled eggs and vegetables all use this method. Steaming is a healthy cooking method as it captures all of the nutrients of the food during cooking. You can buy special steamers, which are ideal for this purpose or steam using a saucepan although this can be trickier. The water supply needs to be very little and the food should be cooked to perfection. You will taste the difference between steamed and boiled vegetables. Pressure cooking uses this method of cooking. Broiling is also very easy to do this consists of placing your food in the broiling section of your oven directly under the heat this method is very similar to light roasting and is very popular with meats. Broiling hot dogs or sausages works great. or how to roast chicken. Owning a pressure cooker is an ideal way to cook things, it is truly an easy cooking method and can be used for a variety of items. The temperature in a pressure cooker is very high and it is sealed tight keeping all the steam inside the pot. This will ensure that all nutrients are captured in the food and this provides a far healthier type of food. Frying is a great way to cook foods as it is quick and easy. 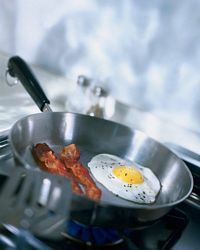 You simply cook items on top of the stove in a frying pan. It is a fast way to cook but you can over cook easily and the food will lose all of its vitamins and goodness. If you must fry food then try to use as little oil as possible and ensure that you do not overcook the food. Try using the coating and breading technique with recipes like Breaded Pork Chops or Chicken Piccata. You really can't get much easier for a side dish with this Zucchini and Mushroom Saute. In frying pan, melt butter. 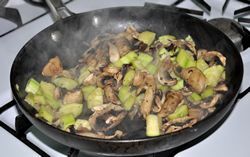 Sauté mushrooms and zucchini. Season with salt and pepper. Sauté until tender. Crock pots are an ideal way to cook casseroles and slow cooking recipes. The crock pot cooks the food at a very low temperature for several hours. This allows the food to cook evenly all the way through and will ensure that it is very flavorsome. These are ideal for people who simply want to throw all of the ingredients in and walk away. 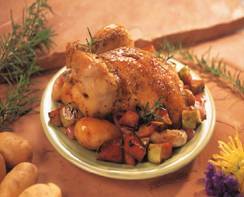 For more on this easy cooking methods see these crockpot recipes. Grilling is a far better way to cook foods it allows the fats in the food to drain away during cooking and achieves a more even cooking. You can grill several things easily. You can cook indoor with a George Foreman grill or an outdoor grill. Hamburgers, chicken or turkey breasts, vegetables and fish all work great using this method. 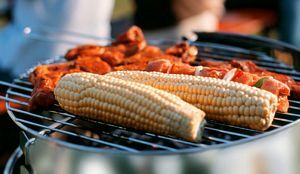 Try some easy grilling recipes. Whichever method to cook you choose you will need to practice them, trying every method will allow you to determine which one you prefer. You will need to use different methods for different foods and half of the challenge is discovering which ones suit which foods and which you prefer. Do you have an easy cooking method tip or recipe to share? Back to basic lessons from easy cooking methods.